Hindu rulers till 1948. This temple is dedicated to Ganapati or Ganesha, the popular elephant-headed deity who removes obstacles and who is invoked at the beginning of all enterprises. 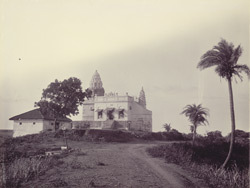 This is a distant view of the temple, a small building with two beautiful shikharas or towers.